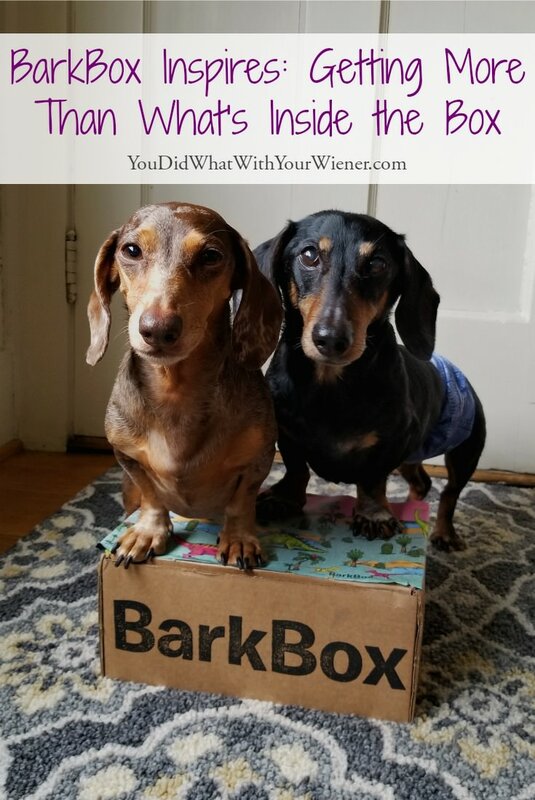 I love dog subscription boxes and we’ve tried many of them. I ordered the first BarkBox for Chester and Gretel almost 7 years ago and I’ve been hooked ever since. The treats and toys that come inside the box are high quality. The treats are always made in the USA, are of similar quality to what I would find in the boutique pet stores I shop in, and the toys we’ve receive are generally on the more durable end (C’mon, Dachshunds ARE strong chewers so I am surprised when a toy last more than a day or three). Now, for me, the surprise alone makes getting a subscription worthwhile. However, the value of the items in the box always exceed the monthly subscription cost (which is $30 and under). To me, the value of a BarkBox subscription is not just what comes inside the box. The goodies that arrive every month are a little different than what I might normally buy myself. In a good way. I’ve tried a lot of toys and treats for Chester and Gretel. At least I used to. I found what I liked and don’t stray far from that. When it comes to treats, that means they end up getting the same thing over and over again. I’m sure the new flavors and textures of treats that come in the BarkBox are a welcome surprise for them. But even more than that are the discoveries I sometimes make through what comes in our BarkBox. Take the recent “miracle”. Gretel’s favorite toy is a nut. It came stuffed inside a squirrel years ago but the toy isn’t available anymore. Anyway, it’s pretty sad looking and we only have one left. I’ve been searching and searching for a potential replacement. Literally, for years. Nothing has been the right size or had the perfect roundness she loves. Back in April, our BarkBox was Japanese-themed and came with a sushi toy. 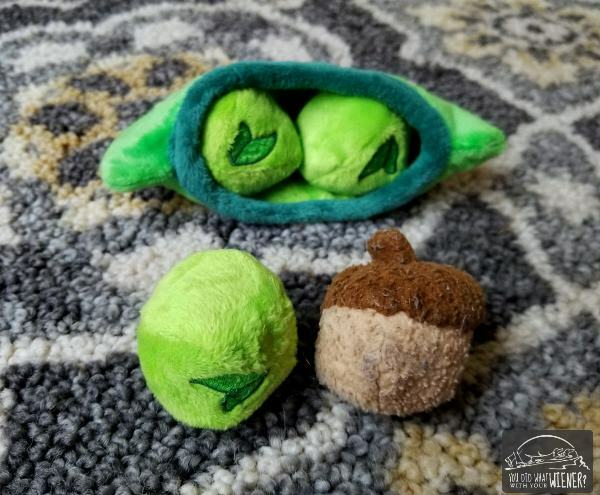 The accompanying notecard showed all of the toys in the series and Edna’s Edamame caught my eye because it looked like it might be a nut replacement. I visited the BarkShop and found it. I also found a pea toy. I bought both. It turns out that the edamame beans, while a hit, are not the size of Gretel’s favorite nut… but the peas are!! Whoo hoo! They’re the perfect size. Now she has more “nuts” to love on and play fetch with (these toys are one of the only things she actually brings back to us to throw again). 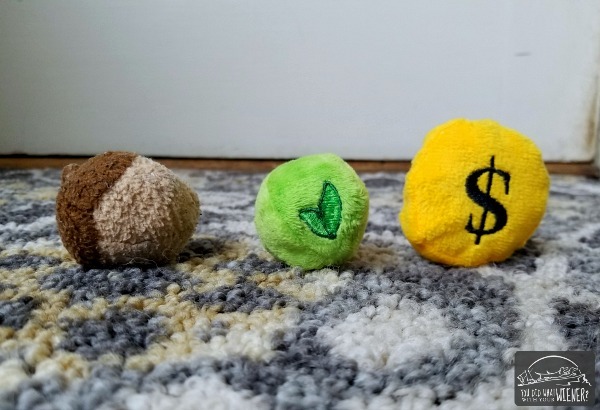 Finding a replacement for the nut is priceless and I wouldn’t have been inspired to browse the BarkShop, and discover the nut replacement toy, if I hadn’t received my BarkBox in the first place. The story gets even better though. Last month, our box was western-themed and came with a “Take the Money and Run” toy. It was a crinkly bag that had little “coins” inside. While they are not spherical, they are pretty much the same size as the nut and the pea. Gretel loves them. More replacements! I decided to check out the BarkShop to see what other funny-named treats they had. Although not cute by name, I found the Coconut and Cranberry Shareables Granola Clusters. They’re a crunchy, wheat-free, 100% human grade, organic-certified snacks that both you and your dog can eat. Unfortunately, they were sold out but I think the idea is awesome. It makes me want to check out the BarkShop more often. I love receiving BarkBox for Chester and Gretel. Honestly, I don’t always love everything inside the box but I usually use enough to feel like it’s worth the money. If there are things in the box that Chester and Gretel don’t like, or I don’t like for them, I donate them to the rescue I adopted Gretel from. Knowing I’m helping homeless pets, and that I’m giving back to the rescue that brought Gretel into my life and made me a happier person, gives me the warm and fuzzies. 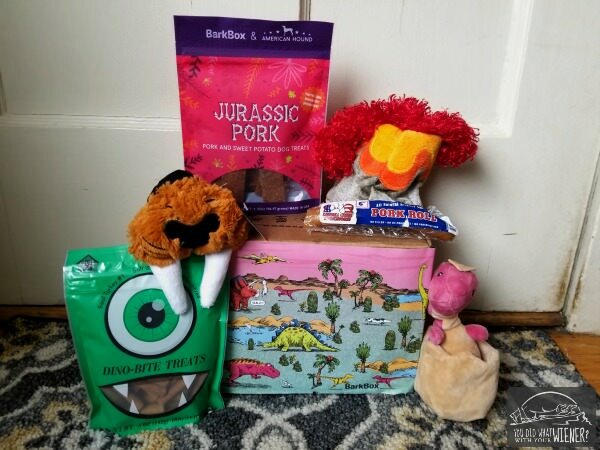 When you consider that BarkBox inspired me to finally discover a replacement for Gretel’s favorite toy (and made that possible through the associated store – BarkShop), to branch out the “flavor palette” for Chester and Gretel, and gives the warm fuzzies from donating stuff to animals in need, it makes it more than worth it to me. See what Chester thinks of the volcano toy that came in this month’s box. Disclosure: This post is sponsored by BarkBox. I received compensation in exchange for my honest review. YouDidWhatWithYourWiener only features products that we would use and everything we say is really how we feel. Thanks for trusting us on that! BarkBox is not responsible for the content of this article. Was it the medium or small peas??? Baby is obsessed with the “coin”..and I need a replacement!